This flag painted here is the infamous 4th Irish Brigade flag. On the day of July 21st, 1861 at the battle of Bull Run Captain Thomas Francis Meagher of the 69th New York State Militia had his horse shot from under him by a round of cannon-fire. Meagher, that day acting as major for the regiment, sprang to his feet and shouted, "Boys! look at that flag--remember Ireland and Fontenoy." 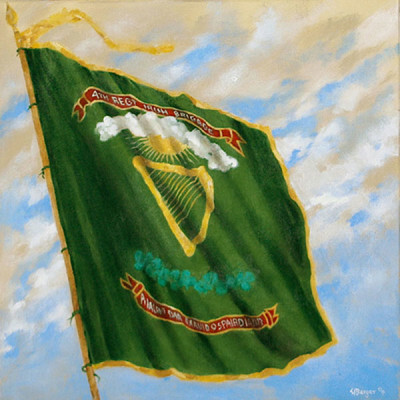 The Irish Brigade was an infantry brigade, consisting predominantly of Irish immigrants, that served in the Union Army in the American Civil War. The designation of the first regiment in the brigade, the 69th New York Infantry, or the "Fighting 69th", continued in later wars. They were known in part for their famous warcry, the "faugh a ballagh", which is an old Gaelic phrase, fág an bealach, meaning "clear the way".